Of course, what is too good too be truly typically is. There is in fact no evidence whatsoever to support this widely shared claim, and it’s curious how anyone could even draw such wild conclusions from the results of the study in question. The research these headlines reference was published in the Journal of Physiology in 2012 and examined the the impact of resveratrol (a natural chemical compound which is a chemical component of red wine) on skeletal muscle strength and cardiac function. The authors found that a diet consisting of ∼146 mg resveratrol (per kg of body weight) per day did lead to greater exercise performance…in rats. It should go without saying that what is true for rats is not necessarily true for humans. Humans may metabolize resveratrol in a different manner than rats and that may affect the compound’s bioavailability and bioactivity, and indeed there is currently no evidence of any resveratrol related beneficial health effects in humans. But even if that finding were completely applicable to humans, the human dosage of resveratrol consumed via red wine in order to achieve these health effects would be death-inducing. There is 1.98 – 7.13 mg of resveratrol in one liter of red wine. Recall that the dosage given to rats to achieve the favorably mentioned health benefits was ∼146 mg resveratrol (per kg of body weight) per day. In order to achieve that dosage by consuming red wine, a 68 kg (150 lb) human would have to drink somewhere in the range of 1,392 and 5,014 liters of red wine per day. Obviously, drinking that much red wine, if even possible, would result in death. 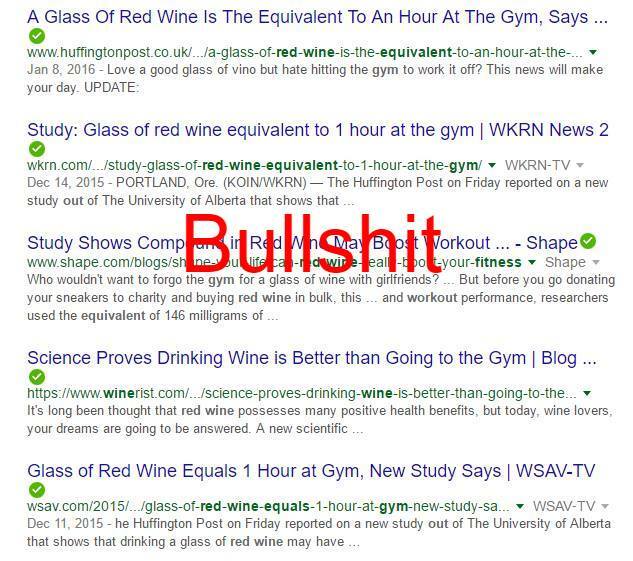 So no, drinking a glass of red wine isn’t equivalent to one hour in the gym. No where in the study mentioned is that claim made. The claim is merely a fabrication and it’s a shame that these “journalists” and their editors would mislead people who don’t know any better into believing junk science just for web traffic.